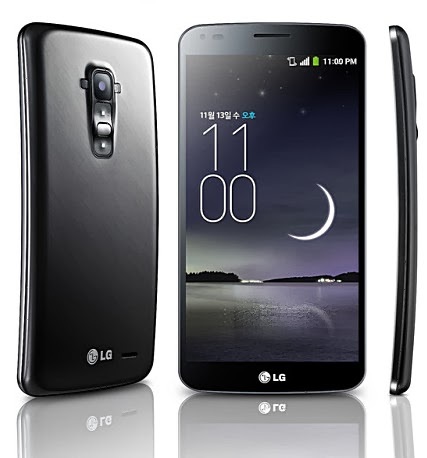 LG G Flex Philippines Price, Specs, Key Features, Release Date : What Makes It Different from LG G2? To be fair, LG is not the first company to come up with a smartphone flaunting a top-to-bottom curved glass display. The other Korean giant, Samsung, was first to release such handset in 2011, the Samsung Galaxy Nexus. Nonetheless, considering the sheer size of LG G Flex, the device remains to be very remarkable and visually arresting. So why the curved screen, you ask? I'm also not sure if it's practical or all that useful but they say having such form allows the phone to hug the natural curves of the human face better when making calls. Announced almost at the same time as LG's new 105-inch curved television, LG G Flex could be considered as a company's co-flagship smartphone alongside the very popular LG G2. In fact, apart from the obvious difference in the display size and curvature, the two phones share largely the same technical specifications with slight variations on the fresher release here and there. Compared to the LG G2, LG G Flex has a larger albeit lower resolution 6-inch HD Curved P-OLED display, lacks optical image stabilization and ultra-smooth slow motion video capture, has a larger 3,500 mAh battery pack to compensate for the bigger screen, and flaunts a plastic back case wrapped by a thin film that dramatically heals itself after getting light scratches, which the phone's backside would have gotten a lot of because of its curved design. These aside, LG G2 and LG G Flex share the same Quad Core 2.26 GHz Krait 400 CPU and Adreno 330 GPU based Qualcomm MSM8974 Snapdragon 800 chipset running Android 4.2.2 Jelly Bean OS skinned by the Korean company's UX Interface replete with unique features like KnockOn and QuickMemo, 2 GB of RAM for efficient multitasking, 32 GB of non-expandable internal storage, the innovative RearKey giving users easier access to the power button and volume keys using their index finger, 13 MegaPixel autofocus camera, 2 MegaPixel front cam, and LTE connectivity support. LG Mobile Philippines has yet to formally launched LG G Flex but it appears Kimstore, the most trusted online store in the country, already have a few units available for purchase. 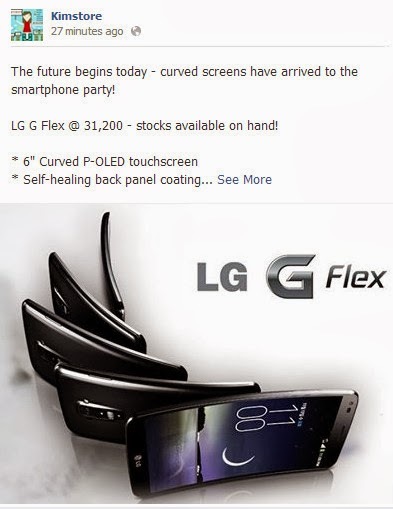 As of today - December 29, 2013, my friend Kim Lato is selling this unique handset for Php 31,200 -- that's Php 8,600 more than the price tag of LG G2 at her store. That's quite a lot -- but hey, it has a curved screen!